Are you having any problem in life ? Like home related, money, enemy, progress, black magic? 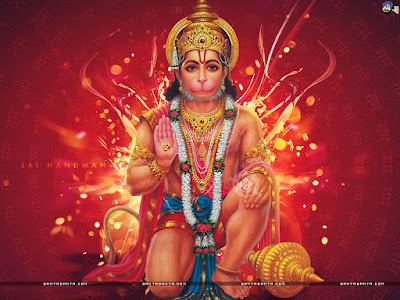 Here is astrology guide which will help how Lord hanuman can solve all this issue. Home: Write “Hanumantaye Namah” on peeple leaf on Tuesday. Put leaves in steps of Hanuman. Chan Hanuman Chalisa. Regularly chant Hanuman Chalisa for one year if problems are big. You can also chant “Ram Raksha Strot”. Offer coconut to Hanuman. Bring it to the home and keep it in urn. Worship the urn daily and do tilak of vermillion. Progress: Offer red flower in red cloth to Hanuman on Tuesday. Also, cover Hanuman in red cloth and offer vermillion and jasmine oil. Chant Hanuman Chalisa. Money: Keep Ramdarbar in home on Tuesday. Write “Ram-Ram” on 11 peeple leaves. Do mediation of Hanuman and share your problems with him. Flow peeple leaves in water after sunset on Tuesday. It is very beneficial in financial problem. Black Magic: Go to Hanuman temple and do tilak to him. Do Hanuman tilak behind your ear. Also, write “Ram-Ram” with Hanuman tilak on your paneling of the home. Do this remedy on every Tuesday. Enemy: Chant “Ram Raksha Strot”. Offer Gada to lord Hanuman. Keep Gada by chanting “Om Hum Hanumantaye Namah” for 108 times. Do this work on Shukla Paksh’s Tuesday between 9 PM – 11 PM. Keep Gada along with you. Enemy never affects you. Do not use silver Gada. You can also wear the root of Apamarg in throat. Chant “Om Hum Hanumantaye Rudratamkaye Hum Fat”. Shani: One faces problems in employment and income. One constantly face financial problem. One also face health issues, especially nerve and bones problem. In these cases, keep lord Hanuman image in which he is sitting and giving blessings. Light ghee’s nine lamps. Offer sweet products to Hanuman. Keep basil leaf in sacrament. Memorize lord Rama before worshiping Hanuman. Start your day after seeing this image. Do vermillion tilak of lord Hanuman image. Keep perfume and supari in front of image. Worship lord Hanuman image, which he stand with the monkeys. Sit on red bench facing north side. Chant “Om Hum Aanjaney Namah” for 2 hours. You can chant Hanuman Chalisa, which is written in red color ink, for special benefits. Chant Hanuman Chalisa, by taking oath, for 100 times to get rid of litigation. Donate Hanuman Chalisa to get rid of Mars related problem. Write Hanuman Chalisa with red color ink on yellow paper. Always keep it with you. You will stay away from every problem.